Here’s this week’s new music roundup, which comes with an apology to half of the bands included. We’re off on holiday at stupid o clock tomorrow morning and that means I should be spending my evening packing rather than blogging, so the tracks are included but half of my accompanying words aren’t, leaving you with just the words I note down before I flesh things out for some tracks. Sorry! Spectrum always has great lines ups, but they pulled out all the stops for Record Store Day – almost a given since the nights are put on in association with Resident, who had people queuing up from 1pm the day before Record Store Day as well as a live 6Music broadcast from Lauren Laverne with Norman Cook and Tim Burgess as guests. It’s been a few weeks since our last New Music post, and we were playing catchup with that one, so there’s a lot of ground to cover. Here’s a selection of our favourite tunes that have come to our attention in the last couple of weeks. 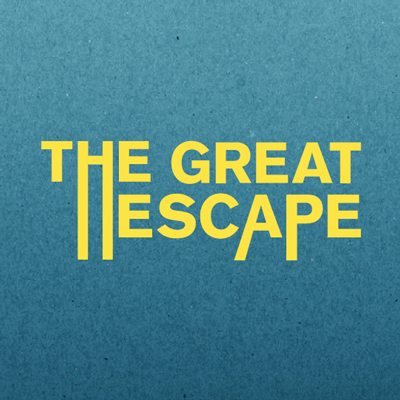 In case you hadn’t realised, this weekend is The Great Escape festival, probably the most important musical event in the local calendar. There’s a few Brighton bands tucked in the main festival, but the bulk of the homegrown talent features in the line-up of the Alternative Escape – a sister festival that runs side by side where for most events you won’t need a wrist band, or have to shell out any money to see some fantastic live acts. There are literally hundreds of bands playing over dozens of events so to help guide you through the weekend here’s our pick of some of the BN postcode-based performers you can catch. The fun begins on Wednesday night with Late Night Lingerie vs The Great Escape at Sticky Mike’s Frog Bar, where can catch the first of Demob Happy‘s many sets of the festival as well as Skirts last ever gig. Inspired Artists Agency who represent quite a few Brighton bands are taking over Latest Music Bar on Thursday, and we’re hoping to pop in for The Slytones at 2.55pm and Moulettes who play at 6.30pm. There are 20 bands over 28 sets on at The Mesmerist on thursday, on the stages put together by Liberty Music PR, amongst others. If we had to pick one it would be Phantom Runners who are on at 9.40pm. Bleach is being taken over by Strong Island Recordings and Pic & Vinyl on thursday, where Brighton Music Blog favourites Curxes take to the stage at 5.40pm. Over at London Road’s newest cafe Presuming Ed, Cate Ferris tops their line up. Miamigo play their debut show at Patterns (formerly Audio) at 6.45pm. Brightonsfinest are in charge at Latest on Friday, and they’ve got a cracking line up. You could pop in at any time and see a great local band, but we’ll be popping in for GAPS at 2.45pm and Spit Shake Sisters at 7.45pm. The Mesmerist also has a pretty good line up, with Black Honey and Oslo Parks catching our eye. One of Brighton’s most written about bands at the moment are The Magic Gang, and they head up the DIY / Echochamp showcase at Bleach, playing at 10pm. Moving on to Saturday, Earworm events and Northbrook college are hosting proceedings at Bar Rogue where we’re tipping Flash Bang Band at 6pm and newcomers Bloom at 6.50pm. The Fiddlers Elbow are having a street party, which is a great idea since I couldn’t get in to see the bands I wanted to last year. If I were you, I’d be down there for Yumi & The Weather at 4pm and Tigercub at 5pm. Marwoods Cafe are hosting some more gentle gigs over Friday and Saturday, but expect things to get a bit more riotous when Black Rooster Black Shag take to the stage at 8.10pm on Saturday night. Tyrannosaurus Dead play their last ever gig in Brighton at Fitzherbert’s a part of Cupboard Music’s line up. They’re only playing one more gig after that, and that’s in London, so expect it to be rammed. Hotel Pelirocco also have an all Brighton line-up – Time for T headline at 10pm, but get down there for 3pm to catch grasshopper who are fantastic. Bleeding Hearts are putting on a gig on Saturday afternoon at the Rialto theatre, which will be the first opportunity to buy headliner Clowwns debut album. It’s not an official Great Escape gig, but it would be churlish not to give them a shoutout. Finally, one of the very last gigs of the weekend is KLDSCP’s party at Sticky Mike’s which doesn’t even kick off until 1am. Mount Bank, who’ve put out one of favourite EPs of the year so far are playing, so hopefully we’ll still be standing by the time they’re on. Here’s our first new music post of 2015. We’ve kept receiving music over the Christmas break, including an incredible five emails from one band about a track we’d already featured in a new music post. Odd. End of year lists are a funny old business. Should they be a measure of the success of the artists on the list you’re compiling? If that were the case then Royal Blood would be the top of any Brighton based list by the longest of margins (and they have been voted album of the year by NME readers). The alternative is that they’re based on personal preference instead, which is incredibly subjective but does give us the chance to enthuse about the things we’ve loved the most over the past twelve months. Being just a list of twenty acts is incredibly restricting too. The past couple of years we’ve put together out best of list as an Advent Calendar instead, which gave us another five acts we could include, but would have meant us getting our act together in November which was never going to happen this year. So here’s the first half of our top twenty – we’ll count down our top ten counting down as we get closer to Christmas. Technically All We Can came out in December 2013, but end of year lists had all been agreed by that point and tracks on the EP are easily as good if not better than most of the new music we’ve heard in 2014. The Vondelpark rework of the EPs title track is pure bliss. Anushka’s Mansions, the lead single from their album Broken Circuit which came out on Gilles Peterson’s Brownswood Recordings was one of our tunes of the summer. To keep us interested while the Brighton / Portsmouth duo inch forward to completion of their debut long player (which has a provision title of Verxes), this year the band put out PreCurxor – a compilation of their early work – and this single, a noisy, frantic affair that’s guaranteed to wake you up. We fell in love with Michael A Grammar’s The Day I Came Alive on the very first listen, probably because it sounded like early Blur and reminded us of our first trips to indie discos many years ago. Dog in the Snow put out a couple of singles this year, with Factory being the more electronic of the two. The video was a fantastic match for the song, initially about mundane daily repetition before morphing into something magical. The New Union continue apace with their melodic indie rock. Now was the first of their two singles of 2014, which was followed up later in the year by the equally great Believe in Nothing. Jacqueline Collyer used to be in Kins, but this year she went solo, ditched the guitars (mostly), and embraced electronica in all it’s forms on her album In The Eyes of the Other from ambient to dance tracks like Ode to a Massive Obsession which is our pick. The Fiction Aisle have only played three gigs, and have only put one track on the internet so far. The man behind the band is an industry veteran though, with over ten years experience under his belt. This year, Electric Soft Parade hung up their hats (except for the odd one off), but Tom White has formed a brilliant new band, recruiting brother Alex on drums, and a cast of thousands. Well, about a dozen. Blood Red Shoes eponymous fourth album was heralded from all quarters as a return to form. Their gig in April at the Concorde was the loudest thing we heard this year. The original version of I Know It’s You made an appearance in our January top ten, but right at the end of the month, Foreign Skin’s remix was post up, which made the track even more lush. The brand new Blood Red Shoes album is out tomorrow, but if you pre-ordered it you got an early download of An Animal, which is also the single coming out on 7″ alongside the album. If you want a physical copy and tomorrow’s too long to wait I did spot that they already had it on the racks at Resident yesterday. Yumi & The Weather gave us their Love as a Valentine’s present. We didn’t get around to posting about it (but we did retweet their link) and since then the link has gone. If you managed to grab the track – all jittery rhythms and slick vocals – then you’ll know why we’re such a fan of this. UPDATE : Yumi & The Weather have just posted that the track is available as part of a Camels & Lions compilation which you can download for free here. It’s been a great month for Brighton’s finest psychedelic rock’n’rollers. Not only have they signed to the mighty Heavenly Records, putting them on a roster alongside Toy and Charlie Boyer and the Voyeurs, but they also released their first single with the label, available on their current tour, or as a free download. This month also saw Physics House Band put out an album of remixes of last month’s Horizons / Rapture Ep. Our pick is Ital Tek’s remix of Titan, which wrestles the original into something altogether more dancefloor friendly. Tetrahydrofolic Acid is the first new track released by the band since 2011’s Ventriloquizzing, and shows them heading in a much more electronic direction. To these ears it sounds like To Rococo Rot on a night out with Underworld. Yes, we wrote about Hairstyles before, but that was when it was released as an mp3 download, and this month it’s the lead track on the first cassette released by newly founded Lick Music, who wanted a distraction from making frozen yoghurt. It feels like ages since we first wrote about Michael A Grammar’s Random Vision EP, but it finally came out this month. Lead track The Day I Come Alive sounds like dreamy early period Blur.